Addictions are our human tendencies to be neurotic taken one step further into the realm of brain disease. So, attachment, in the Buddhist sense, is psychological and social fixation on desire (neurotic), but is also physiological, in that it is physically embodied, including but not limited to in the brain. The brain is altered by the process. At some point this physiological alteration becomes sufficient for it to be called a brain disease. That then, in Kimber’s perspective as I understand it, is the point where it is designated as addiction. Some addictions involve irreversible physiological changes and thus require ongoing drug treatment to maintain functional brain chemistry. Notice here that all attachment, all fixated desire, has a physical element. When of character and degree to be signficantly disfunctional (by some standard), then it is a disease, like other physical diseases. 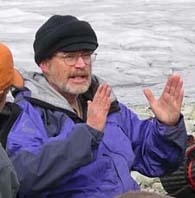 Ben Shaine teaches with college environmental field programs at the Wrangell Mountains Center in McCarthy, Alaska, and as resource faculty at The Evergreen State College. He engages in public policy advocacy with organizations in Alaska and elsewhere, has served as a lobbyist at the national, state and local levels, consulted internationally on issues of urban development and sprawl, and taught at The University of California at Santa Cruz and the Arava Institute, Israel. His years living in the Wrangell Mountains are the basis for his novel, Alaska Dragon, which explores themes of contemplation and action in the context of the American wilderness. Living on Unstable Ground by Benjamin A. Shaine is licensed under a Creative Commons Attribution-ShareAlike 3.0 Unported License.